[ #Animation #rigging #Software #Cartoon #news ] After four years of rigorous development and testing, yesterday at IndieCade 2017, software-animation pioneers, Nukeygara announced the official release of Akeytsu, a new tool designed to simplify the process of rigging and animation and also takes as much as 15 times faster the time, according to its beta users. Offering an artist-friendly UI and a host of industry-first tools, Akeytsu is one of the fastest and easiest-to-use rigging and animation programs available for game development. 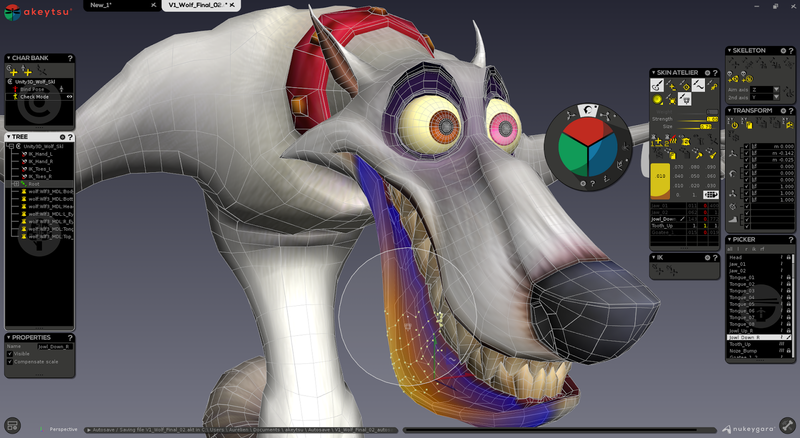 The software was released to combat the heavy and complex 3D tools needed for rigging and animation. The aim was to rethink and reinvent animation tools with the purpose of making them simpler to use, more intuitive and very productive and this was successful with Akeytsu. The official release of Akeytsu features several time-saving industry-first tools, including a new IK/FK solver, a first of its kind half rig mirroring process, partial cycling automation, a new way to keyframe and much more. Early access pricing is available until the official release on October 25, 2017. Light Rig & Skin – Skinning and rigging tools have been simplified to accelerate this entire process. Curve manipulators are no longer necessary to handle the character, as artists can now simply click on the skinned mesh to create their poses. A new duo skin feature provides intuitive duo-steps skinning, saving time without sacrificing high-quality results. IK/FK solver - Doing away with complex manipulators, Akeytsu’s simplified process allows animators to handle IK and FK in a single skeleton. To help develop and polish Akeytsu, Nukeygara put it through a demanding two-year beta process, conducted by over 3,000 animators who used it for gaming, as well animation projects for other mediums. The beta also helped to confirm many of the concerns of Nukeygara’s founders, who felt that current animation tools were unnecessarily convoluted. The result is the first 3D program to provide character keyframe animation and rigging features all in one package, simplifying and speeding up the animation process without compromising on quality. Nukeygara was officially unveiled at IndieCade on Saturday, October 7, 2017. Akeytsu will be available in three versions: Learn (free for students and teachers, $39 for educational institutions), Indie ($179) and Pro ($589). In order to qualify for the Learn version, users need only verify that they are current students and use the program for non-commercial projects. The commercial use of the Indie and Pro versions will be determined by the revenue of the company using the program. In celebration of IndieCade’s 10th Anniversary, Nukeygara will continue to offer its Early Access pricing throughout the show and until the official Akeytsu launch on October 25, 2017. Purchasers can download the Akeytsu beta now at the deeply discounted Early Access price, then once the official version is released they will be upgraded at no additional cost. Akeytsu Early Access pricing is: Learn (free for students and teachers, $16.99 for educational institutions), Indie ($79) and Pro ($279).